Arts Umbrella dancers get chance of a lifetime – to perform alongside Europe’s top dance company! While the workshops have been planned for several weeks, the performance schedule has just been finalized! We are thrilled to announce that AUDC dancers will be performing with the premier dance company of Europe, Netherlands Dans Theater 1in Holland! They will perform a piece by Fernando Hernando Magadan, “Take Off”, which was choreographed for the AUDC in 2013. The young dancers will be performing this beautiful piece with the dancers of NDT. AUDC and NDT will perform “Take Off” as part of NDT’s annual Gala event Switch, on March 22, 2014. Switch brings dancers from two companies, NDT 1 and NDT 2, together in an exceptional program of new, self-created choreographies. In an interesting twist, the dancers take on responsibility of organizing the entire show, and all revenue raised, including ticket and merchandise sales will be donated to a charity selected by the artists. Creative and surprising, every Switch is an exciting new experience. Switch takes place at the Lucent Danstheater in Den Haag. The show will start at 2pm and be open to the public. Follow our dancers on Facebook as they post photos of their experiences on tour. For more information please contact Arts Umbrella Dance. 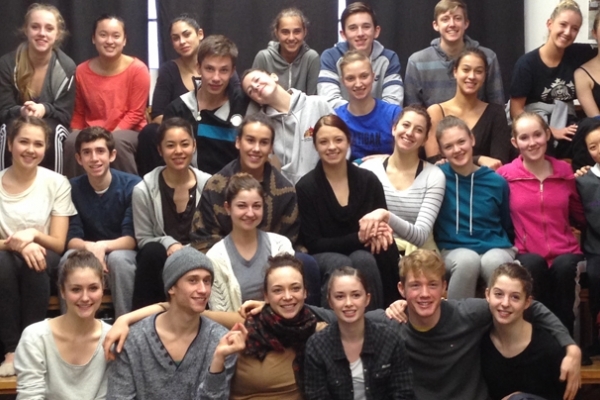 Members of the 2013-2014 Arts Umbrella Dance Company getting ready for their European tour.